Here's the final chapter in the 2011 Big Sit report from the Indigo Hill Birding Tower, home of The Whipple Bird Club. As the day wore on toward afternoon, the bird activity really tailed off, as you might expect. Our list was at 66 at 11:00 am. By 11:30 am we'd added a distant osprey (67) and northern harrier (68). Just before noon I saw a bird flying to the northeast of the tower. It was a mid-sized bird, with an undulating flight pattern—definitely a woodpecker. Then it dipped sideways in flight and I caught a flash of large white wing patches! YES! A red-headed woodpecker! My favorite bird species of all and it moved our Big Sit list into a tie with our all time record. And it was not yet noon! At 12:05 pm a red-breasted nuthatch called from the pines along the meadow. Jim and Julie heard it and Julie called it in—red-breasted nuthatches must be lonely little souls since they always respond to imitations of their calls. That was species number 70! A NEW BIG SIT RECORD for our circle! There was copious jocularity and riotous rejoicing! Then came hours of no new birds—plenty of neat birds to see, but no new species for the list. These were the wasp-swarming hours I mentioned in my previous post. Most sitters left the tower to eat, rest, rest stop, refit, leave, or go bugging in the meadow. Binocs up! 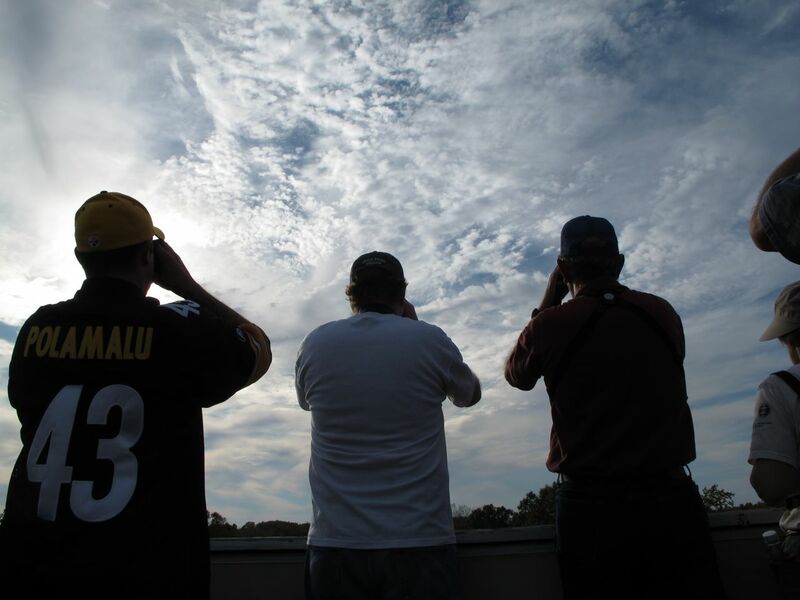 Few birds escaped our watchful eyes as we scanned the sky from the Indigo Hill Birding Tower. By 3:30 pm our eyes were starting to blur and the beer in the cooler was starting to sing its siren song. Just when we though we were stuck with a tie, I hear the familiar rattle of a wren from the brambly wildflower meadow to the east of the house. I heard it several more times—enough to recognize it as a house wren. Julie and Shila went out from the house to ground-truth it and caught glimpses of the bird and heard snatches of its rattle. That was yet another new record: 71 species, breaking the old record of 70 which had stood for, ummm, about 3.5 hours! 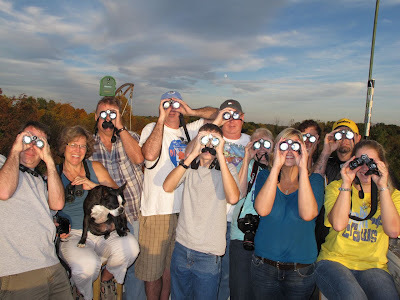 Sometime between 4:00 and 5:00 pm I spotted our final bird species of the 2011 Big Sit. A lone rock pigeon flew past the north side of the tower, headed east. Not a very glam bird for a new Indigo Hill Big Sit record of 72 species, but a record-setting bird nonetheless! 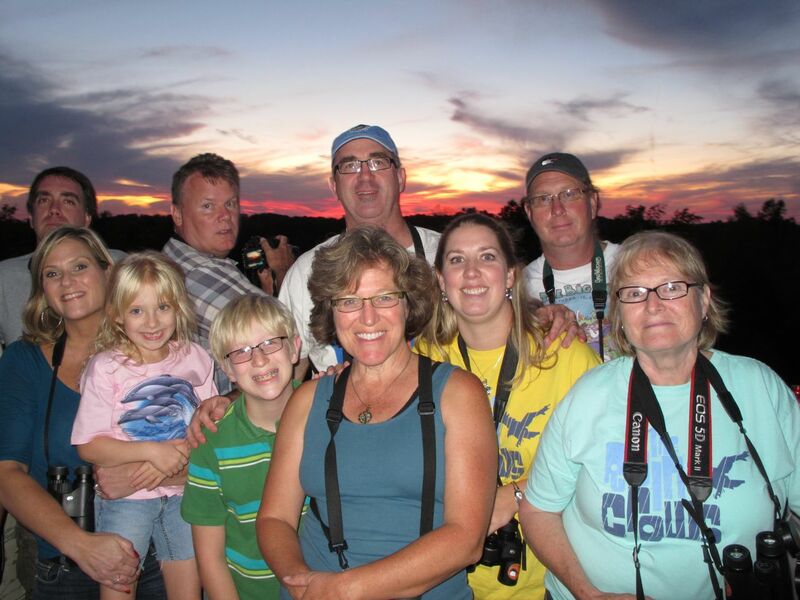 As if all of nature was smiling on us, the sun broke through the clouds and gave us a nice sunset for our group picture taking. We chatted about the day's birds, as we always do near the end of The Big Sit: favorite bird of the day, lucky "gets", hard-to-believe "misses." Some of the species I dream about adding to our Big Sit and farm lists at a future Big Sit: anhinga, sandhill crane, snow goose, and others. 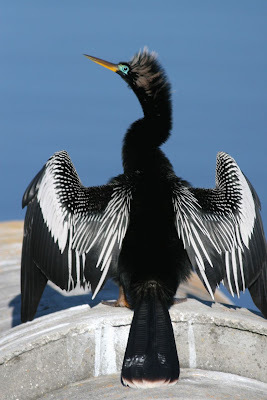 Anhinga is a dream bird for the Big Sit list, but probably not likely. 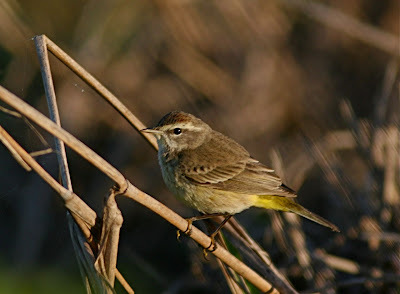 Palm warbler was a big miss from the 2011 Big Sit list. As we wound down, the jokes began to flow. 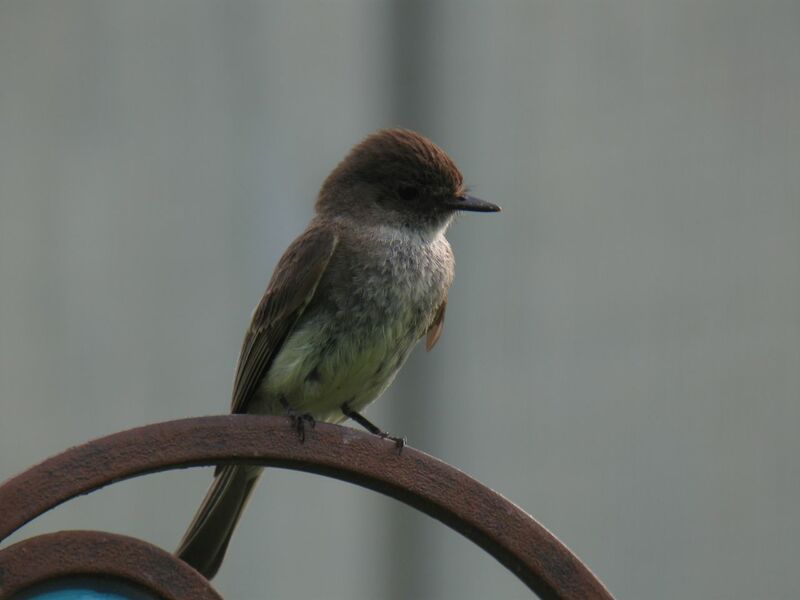 A few birds still visited the feeders and the eastern phoebe that had been around all day was sitting on the telephone wire, tail flicking back and forth. Our local phoebe put on a good show in the late afternoon. The final gang at the 2011 Big Sit—those who stayed until the bitter end, from left to right: Jason, Julie, Chet Baker, Jim, BOTB, Evan, Steve, Shila, Wendy, Nina, Daniel, and Kelly. Photo by Phoebe Thompson. 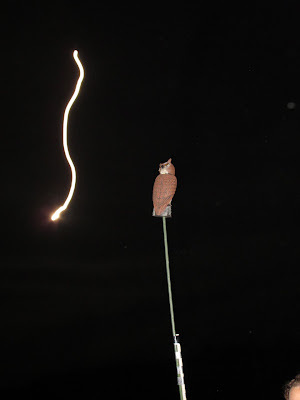 The rising moon made a light squiggle in the night sky behind our plastic great horned owl decoy. The final PlantCam shot from the 2011 Big Sit. About 7:30 pm the wind picked up again, making hearing difficult. It was almost completely dark so we began to tear down. The last trip down from the tower, I grabbed the PlantCam and turned it off. The final photo had been taken at 7:52 pm. It had been a great—a record-setting—day! I love The Big Sit. 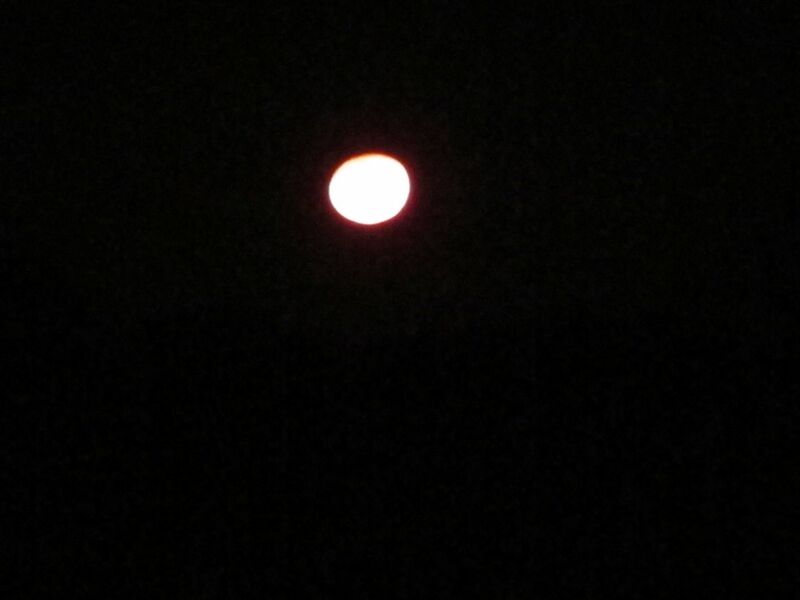 Moon at midnight of the 2011 Big Sit. We left our story last week with me racing (carefully) through the foggy and winding country roads from the high school homecoming dance back home to the farm and the Indigo Hill Birding Tower for the midnight start of The Big Sit! Well, we made it with 10 minutes to spare. Just as I was about to scramble up to the tower, I spied the homecoming princess heading to the master bathroom for a shower. Knowing this would mean 40 minutes of showering and 50 minutes of the roar of the water heater trying to keep up, I begged like the desperate birder-parent I was for a delay in the hygiene-based activity so that the night would remain quiet enough for me to hear passing migrant birds overhead. 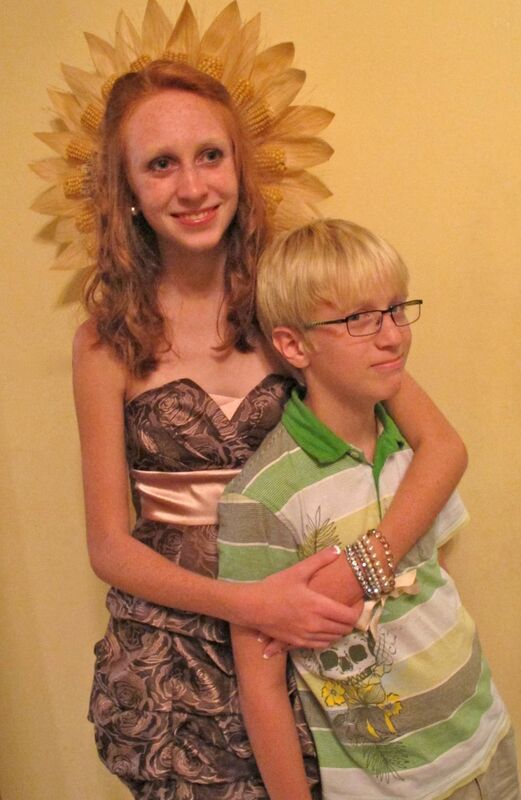 The princess in her regal ballgown and one of her loyal footmen. This was met with the soul-withering, resistance-is-futile, how-dare-you-even-THINK-that I'm-not-showering-now-you-complete-loser-stare from my adorable and indulgent 15-year-old daughter. I tucked my tail between my legs and climbed into the tower, dented not daunted. In addition to the roar of the water heater rising skyward on the south side of the tower, there was the surprisingly loud burble from the bird spa on the north side, and coming from all directions was an impressive wall of insect sounds. Hearing the soft seet of a Savannah sparrow overhead was going to be impossible. Midnight. The hour of enchantment. When everything in the coming day seems possible—even probable! The 2011 Big Sit was ON! My first sound was a nearby ATV. Then some dogs. Then a mufflerless truck. Then coyotes. Plus the shower-bird spa-cricket noise. Then some distant shouting followed by the boom of a large-caliber gun. Then lowing cows. Then coyotes. This went on for nearly 20 minutes before I heard my first bird: a black-crowned night-heron (actually at least three of them) flying in the darkness overhead, occasionally uttering their tell-tale quock! Whoa! That's a species we've only had one other time on our farm and it was on a Big Sit about a decade earlier. I remember it clearly—a line of migrants flying slowly southward against the western sunset. A very auspicious start to the 2011 Big Sit! I smiled as I snapped on my headlamp to tick the night-heron off on the official checklist. Then I pulled out my phone to post the Big Sit's first sighting to Facebook and Twitter. I got immediate reactions from all over the world! Neat! 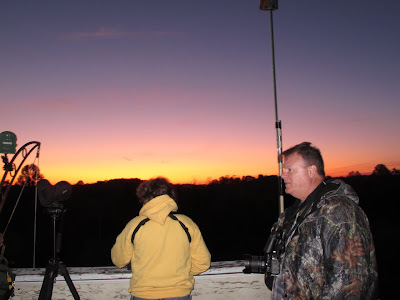 Even though I was alone up in the tower, and would be until just before dawn, I had a digital posse of bird watching pals along with me, connected by satellite-tossed data. Shortly after 1 am the wind picked up suddenly out of the southeast. Weird! Without being able to hear at all now, and with the night being so dark, there would be no new birds added to the list. I headed back downstairs to catch a few winks. I was back in the tower at 3:45 and the wind was gone. Almost immediately I began adding birds as flyovers uttering call notes. Many of them I could not identify, but those that I could (indigo bunting, Savannah sparrow, Tennessee warbler, Swainson's thrush, gray-cheeked thrush) I added to the list. 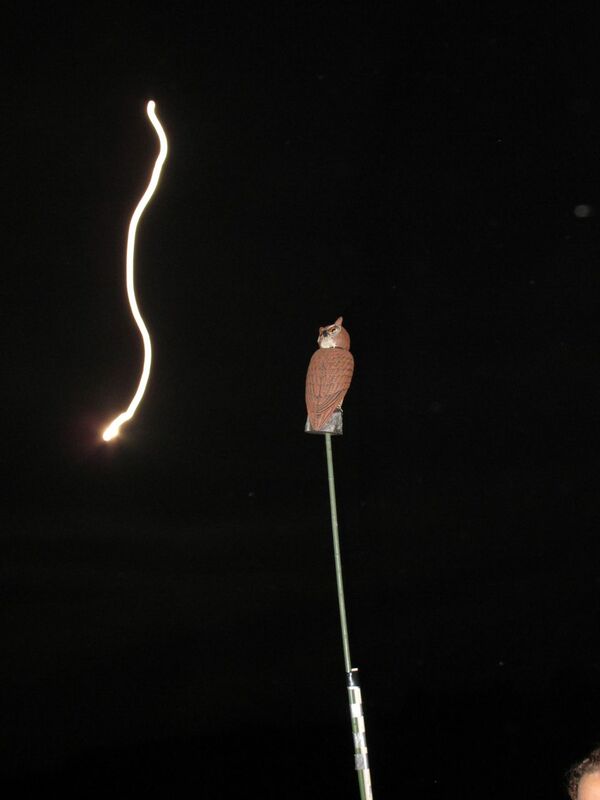 The owls started up, too. A great horned owl hooted from the northeast for the next two hours. And two eastern screech-owls whinnied from the meadow's edge. Julie and Jim (right) joined me in the tower before dawn. About an hour before dawn, Big Sit stalwart and Mr. Ohio Birding Jim McCormac showed up to join me in the tower. 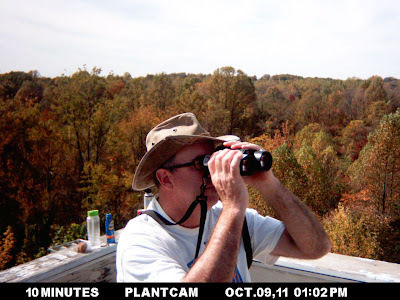 Jim is fun to bird with and always adds a number of species to the list. Sadly most of these are insects and plants which don't actually count on the Big Sit list, but I smile and act like I'm checking them off on the list, which seems to make Jim happy. Seriously, though, Jim's strong birding ears nailed us veery, black-throated green warbler, chestnut-sided warbler, and chipping sparrow. 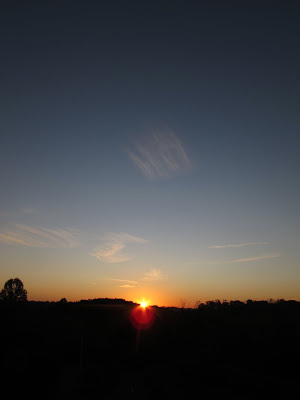 As dawn hinted at its imminent arrival, the resident birds began stirring: northern cardinal, song sparrow, eastern towhee, mourning dove, Carolina chickadee. Actual sunrise on Big Sit day. By the time the sun was up, we were pushing 30 species and already draining a second pot of coffee. It was time for more visiting sitters to arrive. 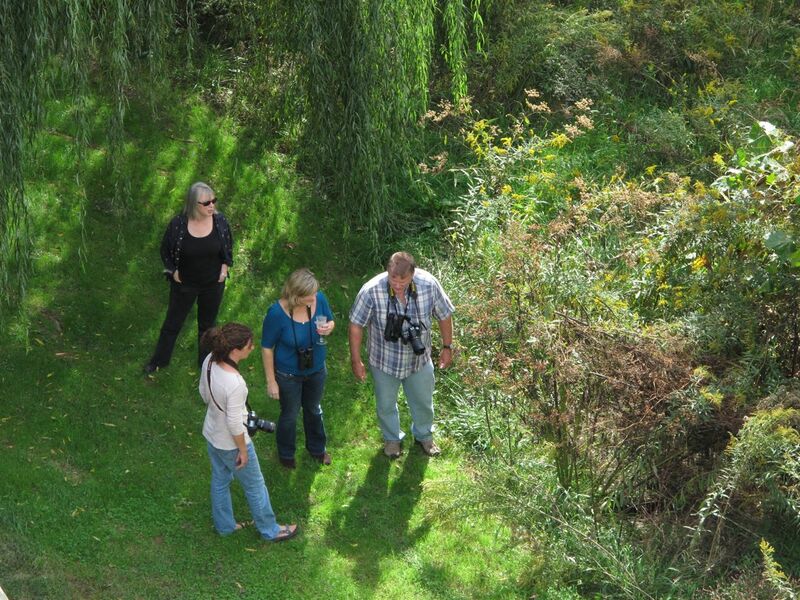 Julie (a resident sitter) came up from the main house and threw her birding powers into the mix. Soon Jason arrived, followed by Nina, and Jen, and Bob and Mimi, and then the day became a blur of birds and shouts, and quick hugs hello, and more coffee. Early sitters in the birding tower, from left: Jen, Jason, Steve, Evan, Julie, Jim, Nina. On any given Big Sit (always the second Sunday in October) we're struggling to delay the end of the summer seasons, to find the last migrant songbirds—hoping for a late wave of warblers similar to those we enjoyed just a few weeks earlier. We're also tugging the season in the other direction, hoping for the later migrants and winter visitors to arrive on time or even early, birds like dark-eyed junco, swamp sparrow, Lincoln's sparrow, northern harrier, pine siskin. We got some of these species this year, but missed some, too. Some birds seem to know you are looking for them and they hide out on Big Sit day. This year it was the juncos and Lincoln's sparrows that gaslighted us. I saw them the day before and the day after. But not on the day of the Big Sit. View from the tower looking ENE. 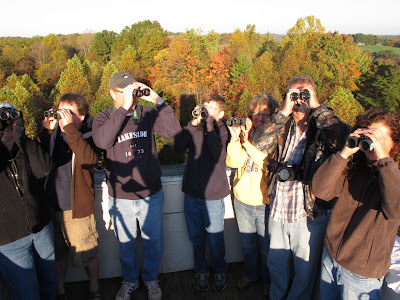 By mid-morning we had a list full of birds (62 species at 9:45 am) and a tower full of bird watchers. 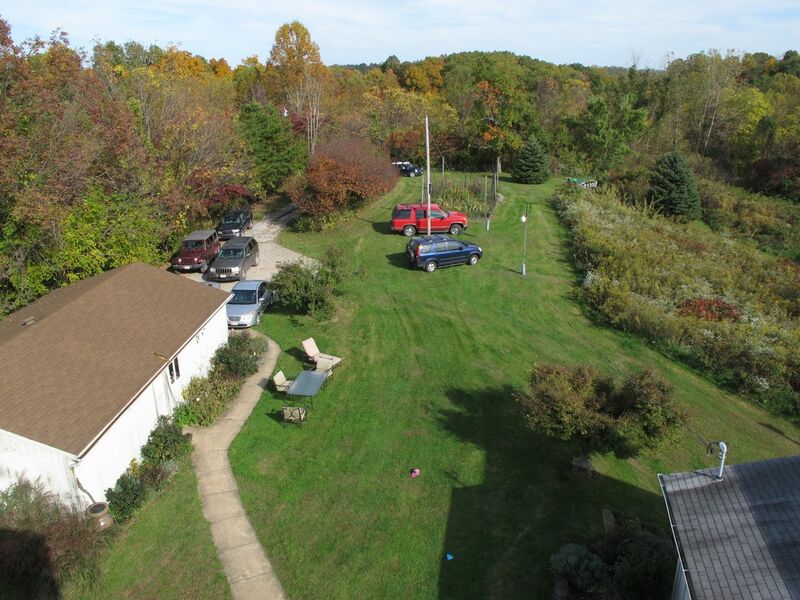 And a driveway full of cars. It was pretty clear that it was shaping up to be a good day–perhaps even record-setting, if our luck held out. I reminded my fellow veteran sitters that we'd been here before (literally and figuratively). Many times in the past we'd race out to an amazing start for the sit, holding a list of 60 species by 11 am, only to spend the next nine hours adding a paltry few to the list. The Big Sit is not a competitive event at all. We compete against ourselves and against all the totals seen our previous Big Sits in this spot. There is a prize for The Big Sit, however: The Golden Bird. The Golden Bird prize is awarded each year based on a random drawing of one species from among all of the bird species seen during the Big Sit by North American Big Sit circles. Then all the teams that saw that species are put into a hat and one team's name is drawn at random. That team wins The Golden Bird prize: $500 from Swarovski Optik to put toward a local conservation cause of the team's choosing. Swarovski has generously sponsored The Golden Bird prize for many years, and we Big Sitters really appreciate their support! The sky made a frowny face. At 10:30 am a frowning face appeared in the northeastern sky, made from cloud bits and jet contrails. I chose not to take this as an omen. Monkey-cam shot of the Big Sitters just before the wasps became active. 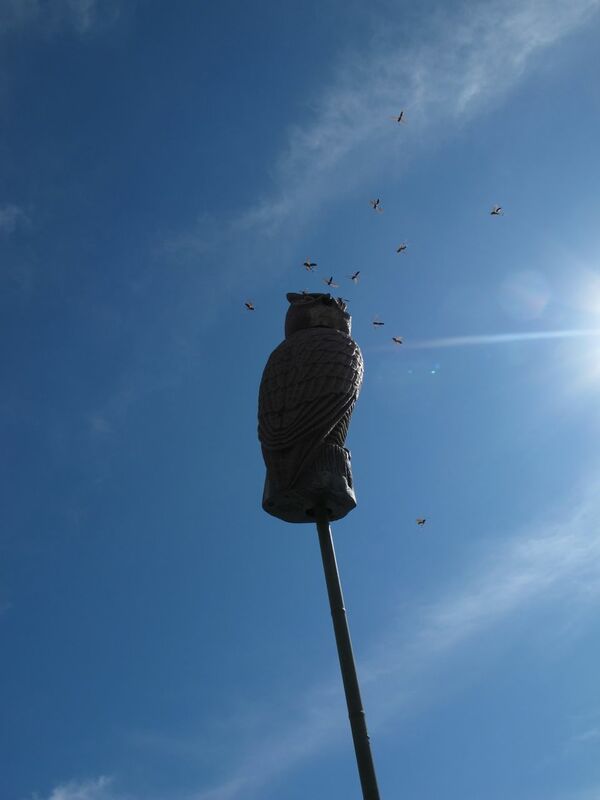 As the day warmed up, the tower's other residents became menacingly active: wasps! Dozens of wasps of two species swarmed about us, never stinging, just making everyone feel on edge. Within 30 minutes I was alone in the tower, wondering about the effectiveness of my deodorant, but hoping it was the wasps that drove people away. While I maintained the Big Sit vigil, Jim organized an insect walk around the farm. He knows more about insects and their sounds than most people know about themselves, so he drew quite a crowd of bug-seekers. Bugging out in the meadow. I watched them sidle out the middle meadow path and tried not to let the swirling cloud of wasps drive me nuts. The plastic owl we'd mounting on a pole above the tower (in hopes of attracting a stooping attack from a passing merlin) was also being plagued by the wasps, though it seemed less perturbed than I was. The afternoon doldrums descended upon the Indigo Hill Birding Tower. 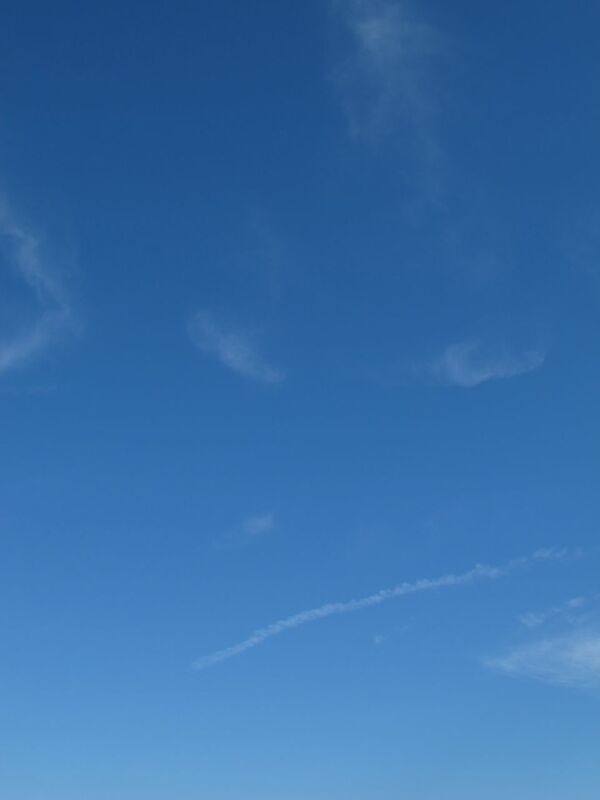 I lay down on the tower floor and scanned the sky for high-flying raptors. Chimney swifts, turkey vultures, and monarch butterflies were all that passed overhead. The awesome loneliness of command. 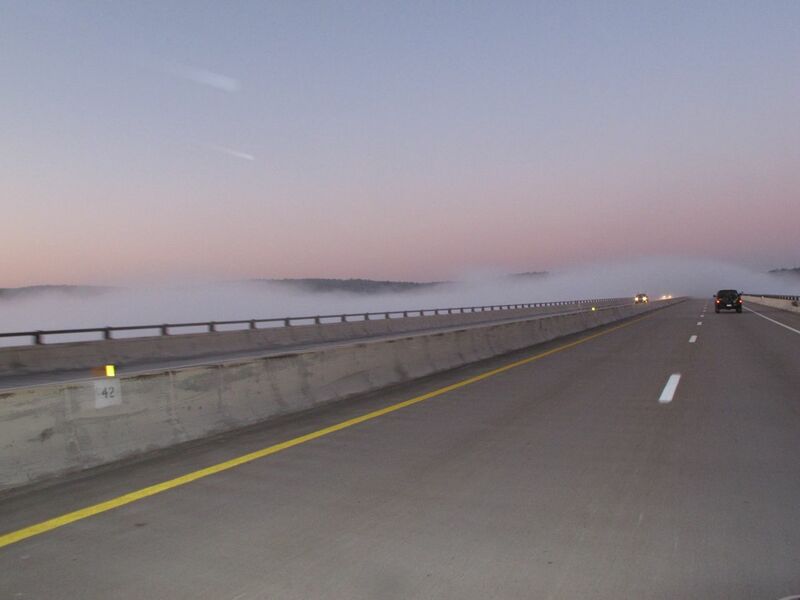 Fog hugs the New River Gorge Bridge. 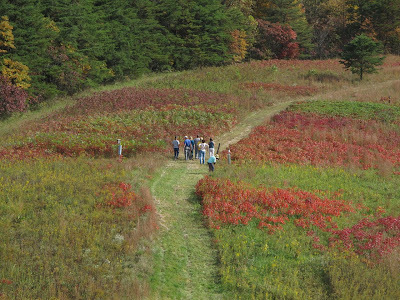 Saturday, October 8 dawned cool and clear in southern West Virginia where I was scheduled to lead a bird walk for the Fall Birding Weekend hosted by the fledgling New River Birding and Nature Center at its new property in Wolf Creek Park near Fayetteville, WV. Normally on the Saturday before The Big Sit I'm running around like a headless chicken trying to get ready for my favorite event of the birding year. But I'd made a commitment to this new fall event run by my good pals Geoff, Dave, Bill, and Rachel. I got up, scarfed down some brekky and headed south across the fog-enveloped New River Gorge Bridge toward the meeting place for the bird walk. 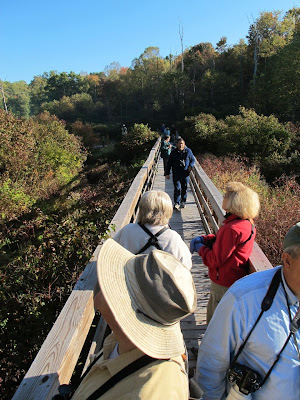 Birding the boardwalk at Wolf Creek Park, future home of the New River Birding & Nature Center. The birding was stupendous at the park! We barely made it 100 feet along the boardwalk before the sheer volume of bird activity forced us to stop and scan with our binocs. Kinglets, vireos, warbler, chickadees, titmice, nuthatches, sparrows, and woodpeckers zipped and flitted in the trees and shrubs along the edge of the woods bordering a creek dammed by beavers, creating a wonderful meeting of wetland and woodland. We noted a variety of species moving on this gorgeous fall day, in particular white-breasted nuthatches, blue jays, robins, American crows, and yellow-bellied sapsuckers. As the day warmed up with the rising sun we began seeing more and more raptors, including several sharp-shinned hawks, a cluster of five (!) Cooper's hawks, resident red-shouldered hawks, and a couple of very late broad-winged hawks. A peregrine falcon shot past overhead—probably one of the pair that nested on the New River Bridge this summer. 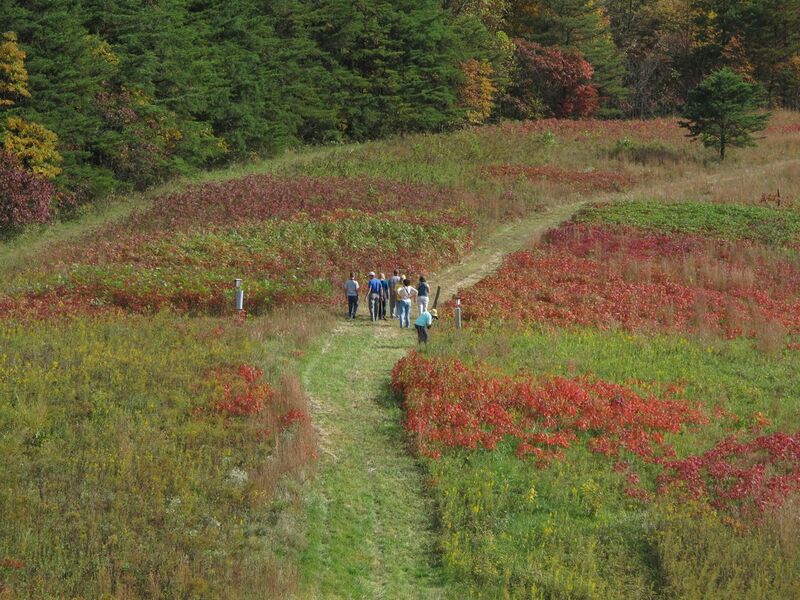 By the time the bird walk ended at mid-day we had more than 60 species. If you enjoy fall birding in an exquisitely beautiful mountain setting, consider coming to the 2012 Fall Birding Weekend along the New River in Fayetteville, WV. It's limited to just 12 people and the focus is on identification and enjoyment of fall migrant birds—especially warblers and raptors. To get on the info list for next year, send an e-mail to goshawk AT birding-wv.com. 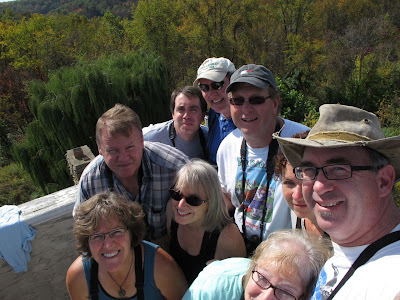 The following day the Fall Birding Weekend gang went to Hanging Rock Tower for some hawk watching, lead by Bill Hilton, Jr. I was sorry to miss this trip and doubly so when I head that they had more than 50 raptors of seven species, including merlin. 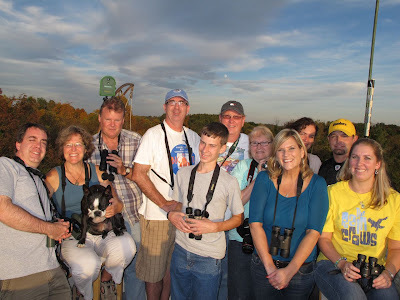 We're hoping that next year the Big Sit and the Fall Birding Weekend will not conflict. And speaking of the Big Sit...I'd done a bunch of prep work prior to leaving for WV. Hauling things to the tower: chairs, coats, hats gloves, towels, optics, clipboard, food, beverage cooler, another beverage cooler, iPod, junk food, heating pad, coffee maker, field guides, cameras, headlamps, plastic owl decoy, more junk food, and Tums. I was ready. But I had just one more task to complete. I had to pick up a princess from a ball. 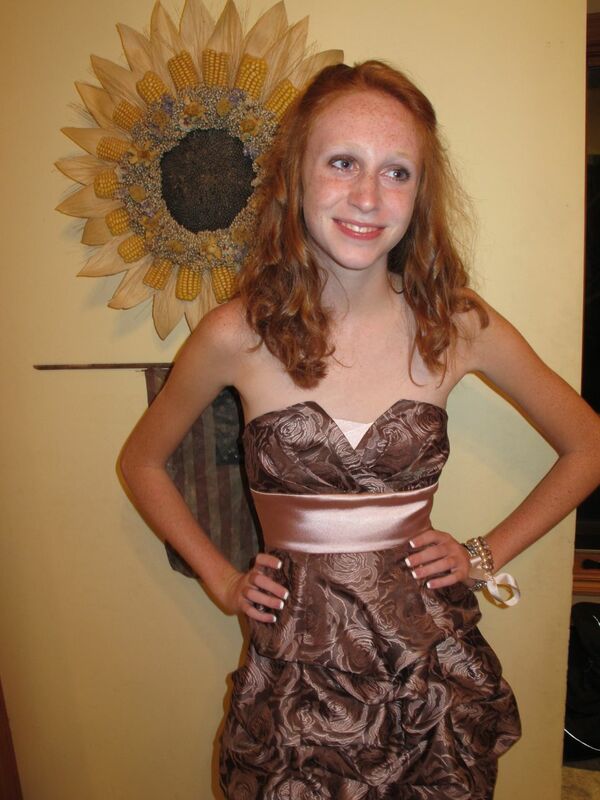 Phoebe all ready for the homecoming dance. Saturday night was Phoebe's homecoming dance and, since Julie covered the drop-off, I was assigned the pick-up duty. The dance ended at 11 pm. The school is a 45-minute drive from home. The Big Sit starts at midnight. Our friends at Wingscapes have been touting their PlantCam as a neat way to take timelapse photographs of plants or anything else. I decided to set my PlantCam to take a photo every 10 minutes during the 2011 Big Sit. And this slideshow is the result. Pretty neat if you ask me! More on the Big Sit in the coming days. Starting tonight at midnight I'll be engaging in the sanity-challenging annual ritual of The Big Sit. If you don't know what the Big Sit is, click on the link in the previous sentence. Or search my blog for the posts from prior years. Of use the Google. It's fun, mostly. I'd take the time to explain about the Big Sit, but I've got to race home to meet the semi-trailer that's hauling a load of junk food to my farm. Yes, for the Big Sit! We'll have enough Snickers and Cheetos on hand to give all of southeastern Ohio an upset stomach. But that's how we roll. The Whipple Bird Club will be in the hizzle for the Sit, as usual. And when the last bird has been seen and the sun is dropping low in the West, we might just crack open a few bottles of something special in celebration of another great day of birding. It's not too late to make your own Big Sit circle. It's free, low-key, non-competitive, and, lest we forget—FUN! Just go here and do your worst! People who know I am into birds, but who aren't themselves sometimes ask me "Are you an orthinologist?" Sometimes they get it right and say "ornithologist." That's the right pronunciation, but the word—in either form—does not apply to me. In order to be an ornithologist in the true definition of the word, one has to study ornithology. I tried this in college at Miami University in Oxford, Ohio. I was there in the early 1980s and, as an avid bird watcher, it seemed completely logical that I would take Ornithology. I applied to take the course as a sophomore and had to get special permission, since it was a course intended for upperclassmen. Doc O was the ornithology professor at Miami back then. He let me in his class because I said I knew my birds. What I should have said was "I know (and vastly prefer) my birds in the wild, on the wing, flying free." I was good enough in the field that he even let me co-lead some of the class field trips with the class' teaching assistant. But in the lab, I was lost. I could no more calculate the wing load of a vulture than I could eat what a vulture eats. This should have been fair warning to me. A hint that maybe I wasn't cut out to get a PhD in ornithology. However I was undaunted. I still thought that in order to be a successful birder, I should apply myself in the ornithological classroom despite the fact that it was as baffling as Keynesian economics to my brain. I was wrestling my grade just north of a B-minus (straight A's in the field quizzes, straight C's in the lab work) when I met my ornithological Waterloo. 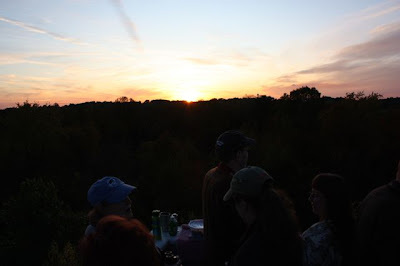 There was a field quiz at Hueston Woods State Park. I was leading half of the class. It was a cold but birdy winter morning. We saw a bufflehead. It was listed on the master test list as a hooded merganser. Thinking I was being helpful, I pointed this out. This was not cool. Due to my inability to excel in the lab, I ended up with a C in ornithology. 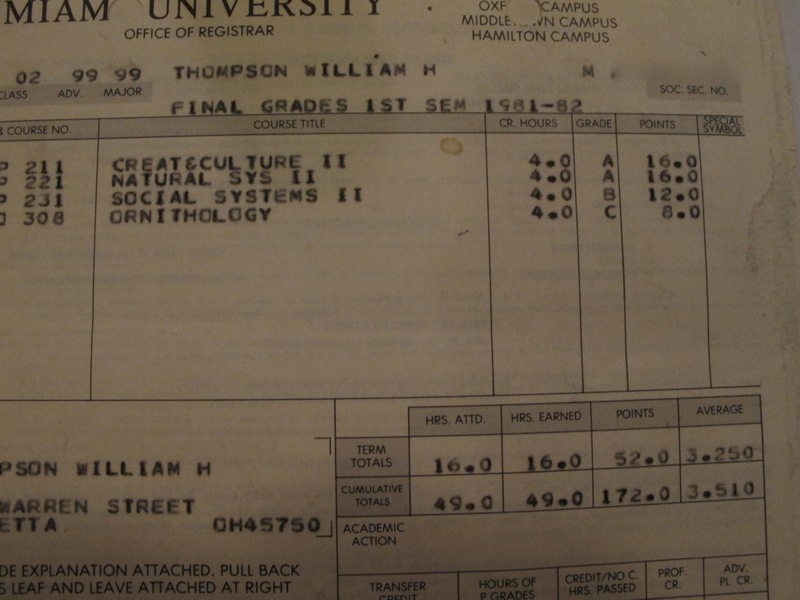 And here's the report card to prove it. My lowest grade in four years of college. Sweet! Now you might think that this scarred me for life. 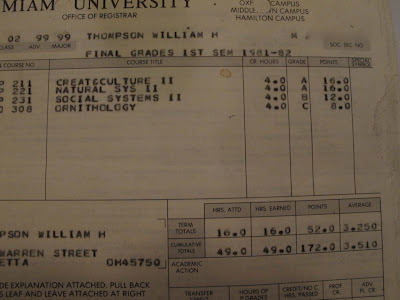 That I ran home to my dorm room and burned all my copies of The Wilson Bulletin and The Auk. Quite the contrary. I recycled them. Seriously, though, I hold ornithologists in the highest possible esteem. 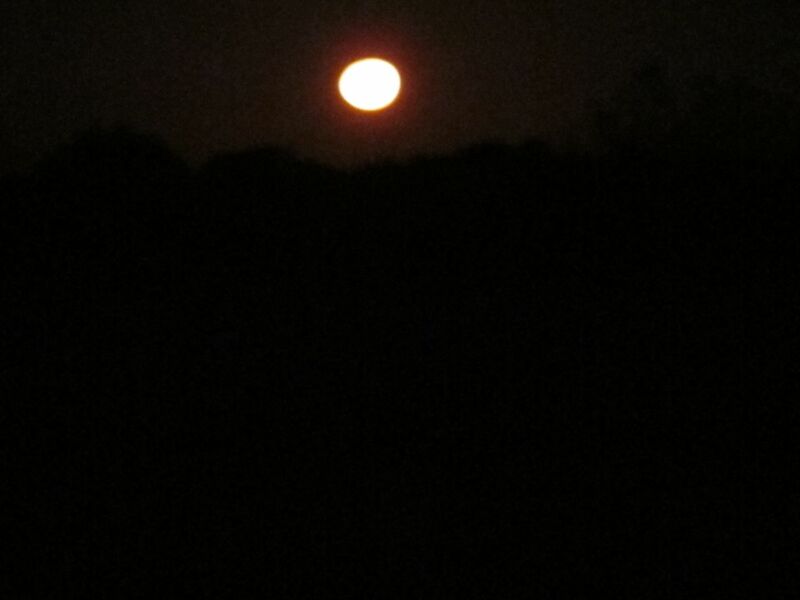 Without them and all of the discoveries and knowledge they've shared we'd still be birding in the Dark Ages. No field guides. 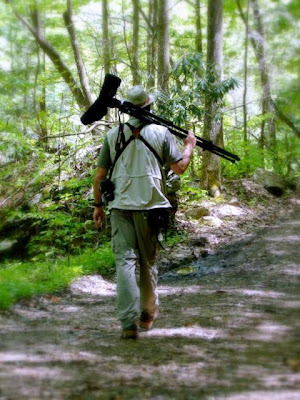 No grip on bird population trends and endangered species. No conservation plans. No lumps and splits! It's impossible to think of a world without these scientists of birds. I am happy to my soul that there are ornithologists treading this mortal coil, dedicating their lives and careers to the pursuit—in lab and field—of a greater understanding of birdlife. I respect people who hold vast amounts of bird science in their heads. But I don't wish to be one of them. The most important thing I learned in Ornithology class? That I'm just a bird watcher. It fits me better. I get to edit my nice little bird magazine. I get to write books and blogs and stuff like that. I get to lead bird walks for people, which I really enjoy doing. And I never have to calculate the wing loading of a turkey vulture. I just get to enjoy watching them fly. Outside, in the field, where I belong. My name is Bill and I'm a bird watcher. New Episode of "This Birding Life!" Director David Frankel on the set of "The Big Year" with Steve Martin (left) and Jack Black. ©Murray Close. Episode 33 of my podcast This Birding Life is now live over at Podcast Central and in the iTunes Store Podcasts category. This episode is an interview with David Frankel, director of the movie "The Big Year." 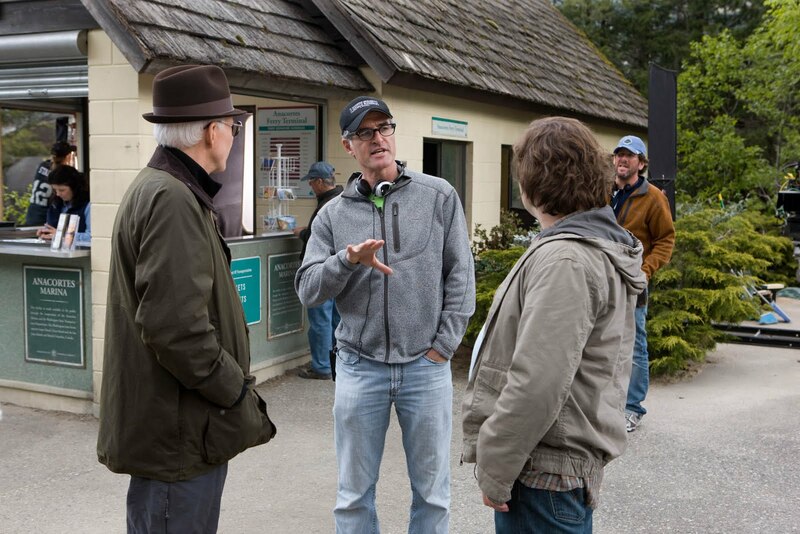 David also directed the hit movies "Marley & Me" and "The Devil Wears Prada." 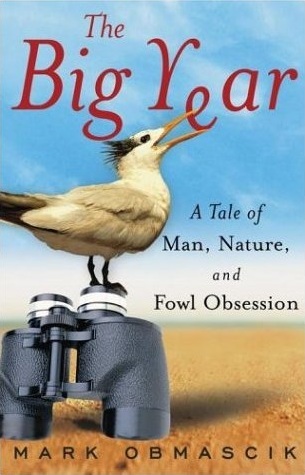 In the interview we chat about the making of the movie, the central theme of the movie and the book upon which it is based (Mark Obmascik's classic book The Big Year), the movie's all-star cast (Steve Martin, Owen Wilson, Jack Black, et al), and how birding and birders are portrayed in the film. You can't swing a catbird by the tail these days without hitting some sort of reference to this movie on birding and movie blogs, Twitter, Facebook, and even the movie's promotional trailer, which is being run during NFL football games! I'm hoping this will be a really great boost for our favorite hobby, but I have to admit that I'm really curious about how Hollywood's latest portrayal of avid birders will be received by the world at large. 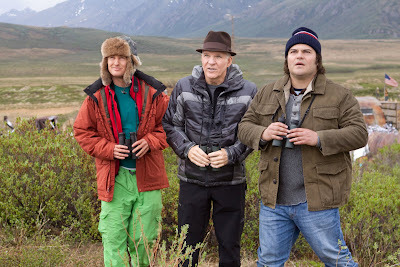 The three lead actors in "The Big Year" are, from left: Owen Wilson, Steve Martin, and Jack Black. Photo © Murray Close. Give the podcast a listen and let me know what you think. Thanks for lending me your eyes and ears.